– A shared conviction that antibiotic resistance is a universal problem. Like global warming, it requires joint action, not least by governmental alliances. – A clear signal from the pharmaceutical industry that return of investment on research and development of new antibiotics and diagnostic tools will have to be de-linked from market sales in order to boost necessary innovation while yet limiting the use of antibiotics. This requires a new business model where private and public sectors cooperate. – A strong recommendation to all stakeholders to speed up the efforts to limit unnecessary use of antibiotics, while at the same time making the medicines affordable and accessible in developing countries. – A commitment to improve the monitoring of antibiotic resistance across the world, through shared data and increased efforts. A global network of surveillance will require common methods, and is crucial for both prudent use and needs driven development of new agents. From the January issue of Emerging Infectious Diseases, published by the CDC (and therefore free. Must I keep urging you to read it? Go, already), here’s a roundup of bad news about bad bugs. And just to make clear we’re not blaming every microbiological evil on farming: Seagulls in Portugal have been found carrying multi-drug resistant E. coli in their feces. The public health concern here is obvious: Just think back to the last time you were at a beach, or anywhere else seagulls frequent, and envision a seagull perch — and the masses of seagull droppings streaking it. Now imagine those droppings transmitting antibiotic-resistant E. coli into the surrounding environment: the boardwalk, the beach, the towels… Additional problem: Seagulls are migratory birds, so the resistant bacteria easily cross borders and oceans. We’ve talked before about the shrinking number of drugs available to treat MRSA and about the challenges of getting new drugs to market. Well, it’s not just a problem in the United States. A new report from the European Centre for Disease Prevention and Control (ECDC) and the European Medicines Agency (EMEA) — that’s the CDC and the FDA of the European Union — analyzes the bench-to-market “pipeline” of new drug development in the EU and finds… not good news. Out of 167 antibacterial agents that are somewhere in the pipeline of development, only 15 look likely to improve treatment of resistant organisms over drugs that already exist — and 10 of those 15 are in early-stage trials and will not come to market anytime soon. If you’re wondering whether you should be depressed, the answer is Yes. … it is unclear if any of these identified agents will ever reach the market, and if they do, they may be indicated for use in a very limited range of infections. 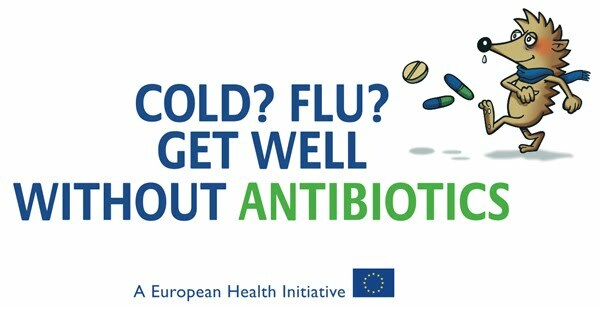 …a European and global strategy to address this serious problem is urgently needed, and measures that spur new antibacterial drug development need to be put in place. This echoes a call that has already been made in this country by the Infectious Diseases Society of America, which has asked for changes in incentives to drug-makers, and has backed what’s known as the STAAR Act (STrategies to Address Antimicrobial Resistance). With this latest EU report — which comes on the heels of a US-ER agreement to work cooperatively on resistance — the IDSA is asking for an international commitment to bringing forth 10 new drugs in 10 years, what they are calling 10 x ’20. It’s not very likely that people will be eating much pork today — OK, maybe some pancetta in the Brussels sprouts — and that’s good, because there’s lots of news today about MRSA in pigs. In humans, colonisation with MRSA ST398 originating from pigs has been identified as an occupational health risk for farmers and veterinarians and their families. Although MRSA ST398 represents only a small proportion of the total number of reports of human MRSA infections in the EU… in some countries with a low prevalence of human MRSA infection, CC398 is a major contributor to the overall MRSA burden. … Food may be contaminated by MRSA (including ST398), however there is currently no evidence for increased risk of human colonisation or infection following contact or consumption of food contaminated by ST398 both in the community and in hospital. UK and EU readers can hug themselves with self-congratulation this morning (OK, admittedly, for you it’s afternoon already): It’s Antibiotic Awareness Day across the European Union, featuring a slate of public-awareness activities, public-service announcements, educational efforts, and random appearances by the charming little hedgehog above (kicking antibiotics, don’t you see). It’s all meant to convince people that antibiotics are a precious resource and that misusing them encourages antibiotic resistance. 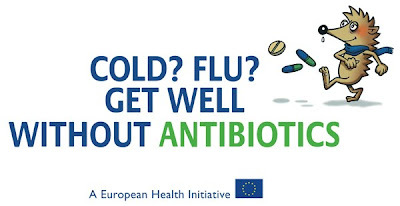 The campaign is organized by the European Centre for Disease Prevention and Control (the EU equivalent of the US CDC) and is being carried out by an enviably long list of national agencies within the EU. It’s accompanied by the publication in the journal Eurosurveillance of an article setting out the challenges of controlling antibiotic resistance across such diverse nationalities and geographies. There are materials on the site that would be useful for anyone attempting to get the message of antibiotic stewardship across to physicians, family members or friends: There’s a fact sheet for the general public, one for physicians and other experts, and one that specifically addresses the temptation to take antibiotics in cases of H1N1 flu. There’s also a short film explaining the genesis of Antibiotic Awareness Day and the basics of antibiotic resistance, and a marvelous set of pull-no-punches short video spots. This one — comparing antibiotics to a lightbulb slowly burning out — is my favorite. Constant readers, we’ve often talked about MRSA and other resistant pathogens as a global problem (cf. these posts for resistance issues in Europe and these for resistance around the world). [We therefore agree}… To establish a transatlantic task force on urgent antimicrobial resistance issues focused on appropriate therapeutic use of antimicrobial drugs in the medical and veterinary communities, prevention of both healthcare- and community-associated drug-resistant infections, and strategies for improving the pipeline of new antimicrobial drugs, which could be better addressed by intensified cooperation between us. “Antimicrobial resistance and the lack of new antimicrobial agents to effectively treat resistant infections are problems that no country can deal with alone — they threaten the very foundation of medical care,” said Richard Whitley, MD, FIDSA, president of the Infectious Diseases Society of America (IDSA). “Without effective antimicrobial drugs, modern medical treatments such as operations, transplants, intensive care, cancer treatment and care of premature babies will become very risky if not impossible.” Dr. Whitley joined with Javier Garau, MD, president of European Society of Clinical Microbiology and Infectious Diseases (ESCMID) and Shelley A. Hearne, managing director of the Pew Health Group in welcoming the multi-country initiative. Well, constant readers, didn’t expect to be gone *that* long. Many apologies. There was a good reason — actually, several: I attended a journalism meeting, and spoke at a second meeting. But most important, I received, marked up, and returned the galleys of SUPERBUG. Yes, it’s really starting to look like a book now. There will be things to share, soon. Meanwhile, I’ll try to roll out some of the many, many pieces of news and research related to staph that have emerged in the past few weeks. Today: News on animals, and our old opponent, MRSA ST398. American agribusiness often has criticized Denmark’s 1998 ban on antibiotics, calling it an outright failure. But compelling new research presented by a Danish scientist earlier this year showed the opposite, revealing that antibiotic use on industrial farms has dropped by half while productivity has increased by 47 percent since 1992. Danish swine production has increased from 18.4 million in 1992 to 27.1 million in 2008. 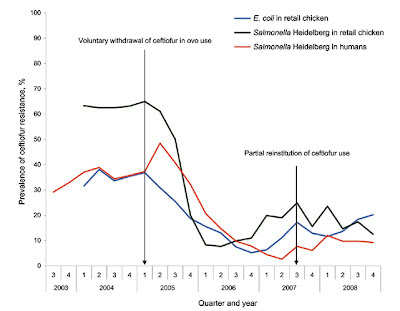 A decrease in antibiotic-resistant bacteria in food animals and meat has followed the reduced use of these vital drugs.